This collection of roses include some of the best for providing constant colour throughout the summer months. 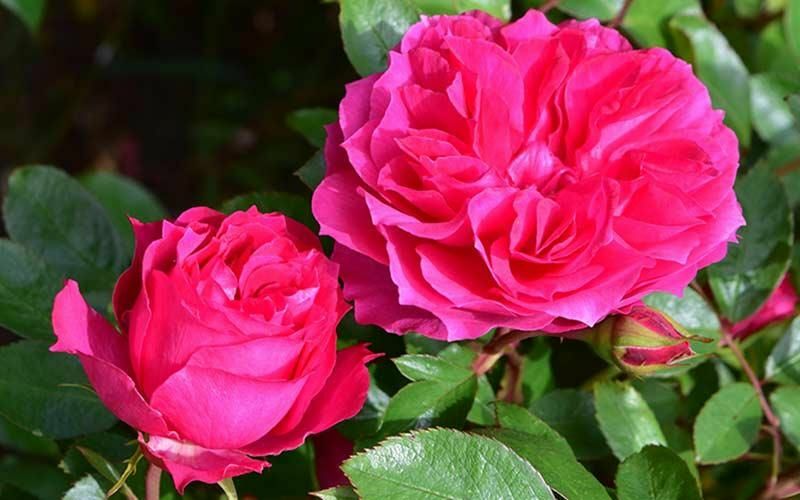 Chosen not just for their incredible flower power but also for their reliability and health, these roses are sure to brighten up any garden. (Floribunda) Shapely flowers of soft, coral pink to blush. Free flowering and healthy. A bedding rose of quality and dignity. Unique to us in the UK. (Modern Shrub) Named for Peter Beales' mother, affectionately known as Nan by family, friends and staff. The flowers are a pleasing mixture of orange, salmon and yellow with a pronounced perfume. Upright in growth it can be used effectively as a specimen shrub or for hedging. Foliage dark green. (Modern Shrub) A large shrub rose or small climber with beautiful high centred deep salmon pink, highly perfumed flowers in clusters. Growth is upright, the plant well clothed in fresh green foliage, a more vigorous form of Aloha. (Rugosa) Fully double, bright crimson flowers on a rugged, mediumsized plant with glossy dark green foliage. Slight fragrance. A useful rose. (Modern Shrub) This rose is a perfect alternative to Golden Celebration or Grace which we no longer stock. Multi-petalled, rich golden yellow colour. Good fragrance and dark green foliage. Bred by Colin Horner. (Climber) Soft, shell pink, semi-double flowers in large clusters on a spreading plant. Foliage dark, glossy and green. (Modern Climber) Fully double, large cerise flowers. Scented. Foliage glossy, profuse and healthy. A good pillar rose or can be grown as a large shrub. The flowers are held in small clusters which are single, bright crimson red with pronounced yellow centres. Leaves are rounded and dense in their coverage. A good rose. (Rambler) Clusters of very pretty and long-lasting, small, semi-double flowers of pink, salmon and gold. Slight scent. Medium, slender growth with not too many thorns. Long flowering season. (Rambler) Almost identical to 'Veilchenblau' but shorter and with a repeat to continuous flowering habit. Trusses of soft purple flowers fade to mauve and grey. Unique to us in the UK. (Rambler) We are delighted to have raised this continuous flowering rambler. It produces masses of medium sized, soft pink flowers in large cascading clusters all summer through. Ideal for pergolas and arches, it has plentiful, mid-green foliage with no more than a smattering of thorns. Introduced for The Campaign to Protect Rural England. (Modern Shrub) A floribunda-like shrub with upright growth and good foliage. Large single flowers of very pale pink to white, borne in large trusses. A healthy strong rose. Clusters of beautiful clear yellow fully double blooms, fading to lemon with age,with a moderate perfume. Foliage is dark green and healthy, an ideal pillar rose. The rose ‘Stamford’s Sanctuary’ has been commissioned by the National Trust’s Dunham Massey in Cheshire, as part of Trust commemorations marking the centenary of the First World War. Between 1917 and 1919 Dunham Massey became the Stamford Military Hospital, where 282 wounded ‘Tommies’ from the trenches were cared for. This year Dunham has been transformed back into the hospital, and ‘Stamford’s Sanctuary’ will be a lasting legacy to its role as a refuge from the horrors of war. (Modern Shrub) Shapely buds open to semi-double, soft yellow flowers. These are produced in large clusters on a reliable plant with good glossy foliage.